Washington — I’VE been hesitant to start writing about Donald Trump. I’d be upset, of course. And relieved that I wasn’t a 0. But I’ve known Trump a long time. That’s how he talks about women. I remember when he sadly broke the news that Heidi Klum was no longer a 10. He's chummy with the Clinton Crime Family, Bibi Satanyahu and the Israhell Gang, etc., so I am guessing that he's a plant to divide the patriotic Americans between voting for himself aka Donald Dump the 'patriotic but independent' candidate and some Republican hack like Jeb Bush or Fats Christie. Shades of 1992 when Ross Perot running for POTUS. You goddamn communist heathen, you had best sound off that you love the Virgin Mary... or I'm gonna stomp your guts out! Trump isn't the only clinical crazy in the GOP race but apparently the only one crazy enough to think Heidi Klum ever was a 10. And judging from his equally crazy ex-wives I certainly wouldn't trust his expert advise on women in general. (2015 Aug 10 08:45)Blackthorne Wrote: He's chummy with the Clinton Crime Family, Bibi Satanyahu and the Israhell Gang, etc., so I am guessing that he's a plant to divide the patriotic Americans between voting for himself aka Donald Dump the 'patriotic but independent' candidate and some Republican hack like Jeb Bush or Fats Christie. Shades of 1992 when Ross Perot running for POTUS. If Donald Trump is a Clinton plant... Is there anything he'd be doing differently? Cui bono? Note how Trump hasn't criticised Hillary much, nor Hillary criticised Trump. And we know Bill talked on the phone with him before he decided to run. Some conservatives seem pretty excited about him, but the only useful purpose he has served is to push illegal immigration up the GOP agenda. And TBH because of the tea party, etc., it already had a pretty high salience before he got in the race. And having the anti-immigration viewpoint associated with a total buffoon like Trump probably hurts our side overall. I don't know whether Trump will actually go 3rd party - it wouldn't surprise me, as it would feed his ego like nothing before - but I predict he will threaten to after the first primaries, leading to months more media exposure. (2015 Aug 10 15:03)Godyfa Wrote: If Donald Trump is a Clinton plant... Is there anything he'd be doing differently? Cui bono? Hillary Clinton was asked recently, within the past couple of days, about Trump's supposedly offensive comments about that slag of a Fox News reporter what's-her-name (Megan Kelly?) and she more or less passed off commenting on it- instead she attacked Marco Rubio about some supposedly offensive comments he said about abortion. I think that's kind of telling that there may be some truth to the belief that more than a few people have that the Dumpster is just a patsy (or willing partner since I don't think he's foolish enough to be a stooge) for the Clinton Crime Family. Patriots siding with any of those candidates in that Punch and Judy show are pathetic anyway, it doesn't matter who becomes president as the problems are systemic. It however is funny to watch how the whole cuckservative establishment is angry, the Koch brothers, Murdoch and Soros now must invest much more to get one of their puppets through. 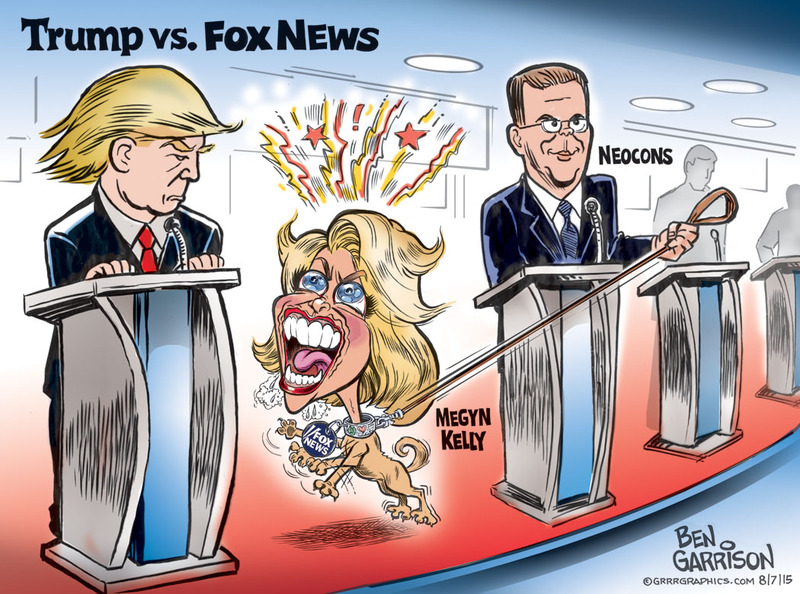 I like Zyklon Ben's actual version of this pic. Among the expansive field of Republican presidential candidates on display in the party’s first debate Thursday night, Donald Trump may be the most closely connected to the Jewish people. Trump is from New York, works in professions saturated with Jews and long has been a vocal supporter of Israel. His daughter and two grandchildren are Jewish, the executive vice president of his organization is Jewish — and Trump certainly has chutzpah. But if you expect to find Jewish donors of influence in Trump’s network of associates, you’ll be disappointed: The billionaire’s campaign is self-financed, not donor-funded. Forbes estimates Trump’s net worth at about $4 billion; Trump says he’s worth $10 billion. As the main attraction of the Republican debate, Trump’s trademark chutzpah was on sharp display. When asked about past references to women he dislikes as “fat pigs,” “slobs” and “disgusting animals,” Trump said he has no time for political correctness. He bragged about how Hillary Clinton dared not miss his most recent wedding because he donated to her campaign. And he refused to rule out running as a third-party candidate should someone else win the Republican nomination. Given his myriad Jewish associations, Trump is not an unfamiliar face in Jewish circles. He has served as a grand marshal at New York’s annual Salute to Israel Parade. After Hurricane Katrina, he was among a group of celebrities who decorated Jewish federation tzedakah boxes to be auctioned off to support hurricane disaster relief. And in February, he was honored with an award at the annual gala for the Algemeiner, a right-wing Jewish news organization. Before the 2013 Israeli election, Trump recorded a video message endorsing Prime Minister Benjamin Netanyahu. By the same token, Trump has made clear he believes President Barack Obama is bad for Israel and has questioned how American Jews could support the president. Trump at times has dabbled in Israeli real estate. About a decade ago, he bought a site in the Tel Aviv metropolitan area with plans to build Israel’s tallest building, to be called Trump Plaza Tower. He later sold the Ramat Gan property to an Israeli firm before its development. In 2012, Trump met with Israel’s tourism minister to discuss possible investments in real estate and tourism, according to the Israeli news website Ynet. Trump’s closest Jewish association is with his daughter Ivanka’s family. Ivanka Trump, a fashion designer and celebrity in her own right, converted to Judaism before marrying Jared Kushner, the son of New York Jewish real estate mogul Charles Kushner. She studied for her Orthodox conversion with Rabbi Haskel Lookstein of Manhattan’s Kehilath Jeshurun synagogue and the Ramaz School, and Lookstein officiated at her wedding. Trump and Kushner are members of Lookstein’s Orthodox synagogue and are Shabbat observant. They have two children. Samo kurvi i konobaru pare ostavljam. And behold the main reason that I have my doubts about Trump. He pretends to be an outsider and not at all a part of the American political establishment but he's intimately connected with the Jewish establishment- which as- anyone with half of a brain knows- serves itself and only itself.